Here's a strange little 52-second song from the film "The Trouble With Girls." Strange, not only because of its length, but also because it uses, like "Love Me Tender," the tune of "Aura Lea," the Civil War poem set to music. The original version therefore relates to the earliest known recording of "Aura Lea"—as far as I am aware, nobody recorded "Violet" before Elvis and I don't see why anyone would want to after him... The "violet" here appears to refer to the colour most associated with New York University, hence the reference in the lyrics to "flower of NYU." The song Aura Lea, or Aura Lee, was published and copyrighted in 1861, with words by W.W. Fosdick and music by George Poulton, just as the American Civil War was beginning. Frances Farmer sang "Aura Lea" in the 1936 film "Come and Get It!" and this is often cited as the original version. However, I have been unable to find a record release of her number. Furthermore, "Aura Lea" was given new words in 1865 when it became the graduation song of the West Point military academy. This new version of the song was called "Army Blue" and it is still sung at West Point. 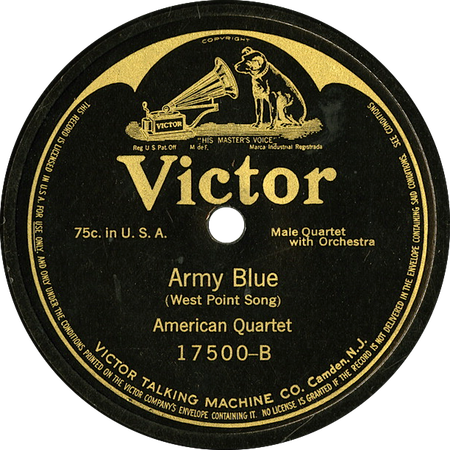 Although the earliest recording of "Aura Lea" that I can find dates from 1937 (the Shelton Brothers, released on Decca in 1938), "Army Blue" was recorded already on 25 November 1913 by the American Quartet and released on Victor 17500.